Most of us have family traditions that revolve around food, a special birthday meal or a unique dish that is served at Thanksgiving. Some of us have a cultural connection to a cuisine like Italian, Middle Eastern or Asian, these are the foods that we share with family and the ingredients that tie us to a culture. 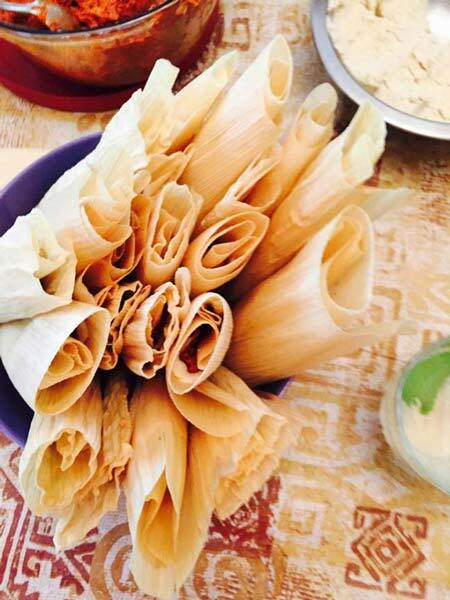 This July 16-19 we are excited to share with you the opportunity to learn a few of the cooking techniques that make up New Mexican cuisine. 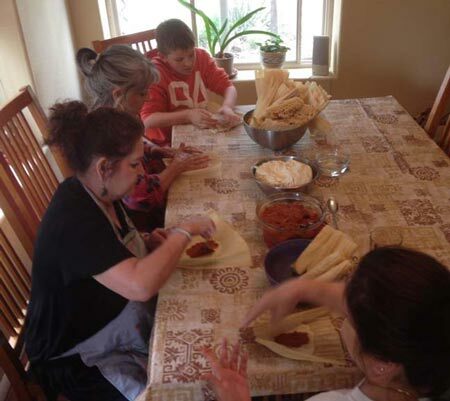 These include cooking with chile, corn and the most important ingredient; cooking together with family and friends. 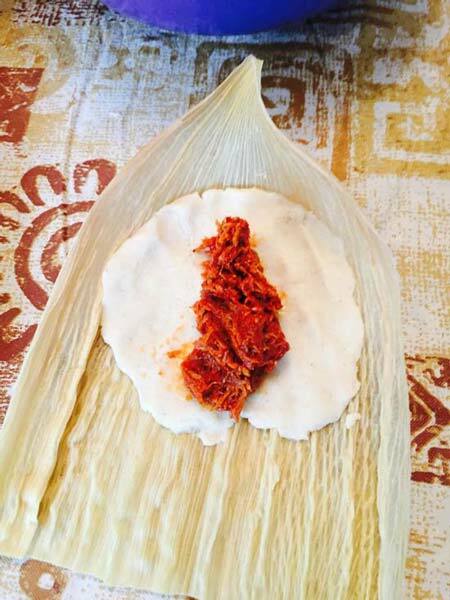 Bel Candelaria Harrison has written this blog post about some of her food connections. The beginning of a conversation that we will build upon during the July 16th through the19th workshop, A New Mexican Christmas in July. Cooking in our large family was woven into our daily existence. Ten of us, eight siblings and Mom and Dad would often sit around the kitchen table to share various cooking chores. Whether the task at hand was shelling salted and roasted piñon (pine nuts) we had harvested earlier that day, and piling the shelled piñon into a single pile just for the sheer pleasure of stuffing all of them into our mouths at once, or processing chile, chopping garlic and onion, cleaning beans, making tortillas, or just having a cup of coffee, we were really quite rich. We were rich not because we were preparing an expensive meal, but rather, most often, a humble meal of beans, chile and tortillas. We were rich because we formed relationships together around our table as we laughed, talked, teased, argued, and sometimes cried. Almost every important event was discussed around the kitchen table. And, the food always tasted soooo good! Today, we relive that sense of family and togetherness every time we gather to share a meal. Friends and family gathering to prepare food and sitting down together to enjoy the results of our joined effort may sound overly simplistic but it is joyful to me, even more so when you have grown your own vegetables, or collected fresh eggs from your chicken coop. 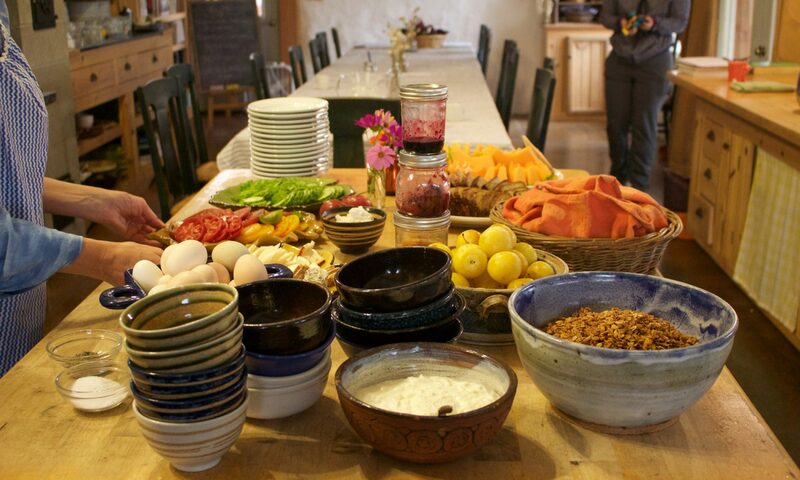 I can’t wait to cook with my sisters at Quillisascut Farm just for that reason. My personal food revelation included discovering Lora Lea and Rick, their farm and the idea of “slow food.” My husband and I have a garden for which he deserves full credit. My appreciation for garden fresh, organic, and sustainable food has grown along with my very first herb garden to our large garden today. My daughter now also has her own garden and chickens. Passing on a passion for good, healthy food is a blessing. The learning continues. Some of my first “food” memories are those with my father and brothers, from sardines, scallions and scrambled eggs, Mexican Pizza, refried beans at 2:00 in the morning to the surgical removal of the egg yolk from a fried egg. The sardines, scallions and scrambled eggs were dad’s creation and he made the best tortillas. The Mexican Pizza however, was nothing I recognized until years later as a counterfeit Italian Pizza. The Mexican Pizza was made of a tortilla, red chile and cheese. Refried beans, well, you add bacon drippings to anything and it is absolutely fabulous! My brother could get anyone to do anything with just a smile like getting me up at 2:00 in the morning to make refried beans. He once removed the egg yolk from a fried egg with a table knife and a fork (I mean no egg white on the yolk at all and egg yolk unbroken) and transferred it on to a piece of tortilla in the shape of a scoop. He proceeded to eat the entire thing with laughing, dark brown eyes wide open! Today, my sisters and I continue to make memories with food. We love to get together with friends and family to cook, laugh, talk and share whether it is a birthday, a holiday, or just dinner. Come to Quillisascut for A New Mexican Christmas in July where we will learn, laugh, talk and share with the Candelaria Sisters! Previous PostPrevious Honey Are You Home?